Coconut Custard Pie is another of my Mom’s great pie recipes. 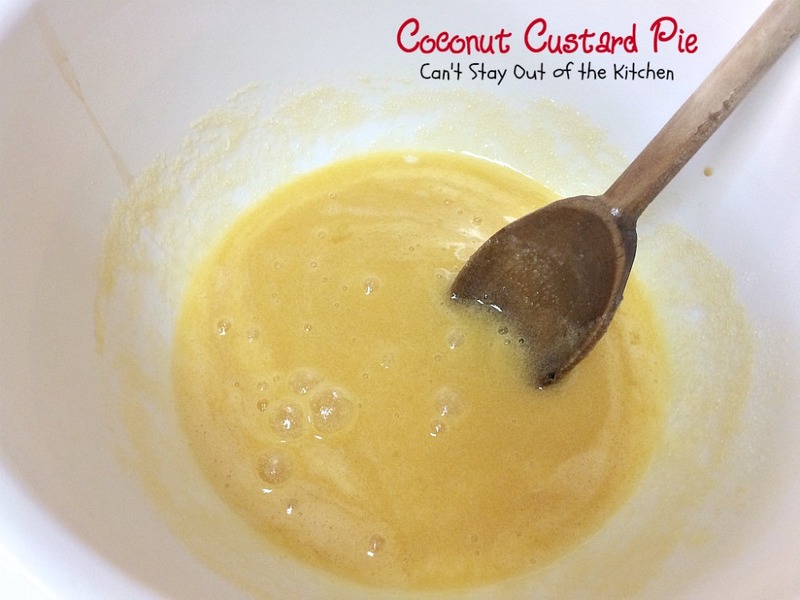 It’s basically her Custard Pie with coconut added. If you’re a coconut lover, this pie is for you! It’s a really simple recipe, too. With seven ingredients it only takes about 5 minutes to whip up and pore into an unbaked pie shell. Then bake the pie until a knife inserted in the center comes out clean. 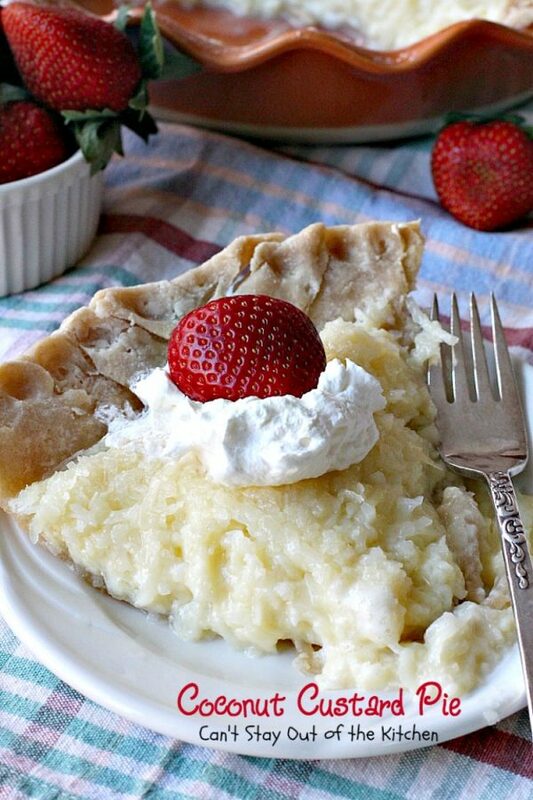 This pie can take over an hour to bake – after all you don’t want it gooey in the middle. Once the pie is totally set in the middle the pie is done. Back in the middle of December my youngest son came to visit us from Pennsylvania. It has been a long time since I’ve baked homemade pies. I bake for the holidays, but we’ve been away during the holidays for three years in a row, so it’s been a while since I’ve made any pies. So when my son flew in for several days I made sure his favorite pies were on the menu. 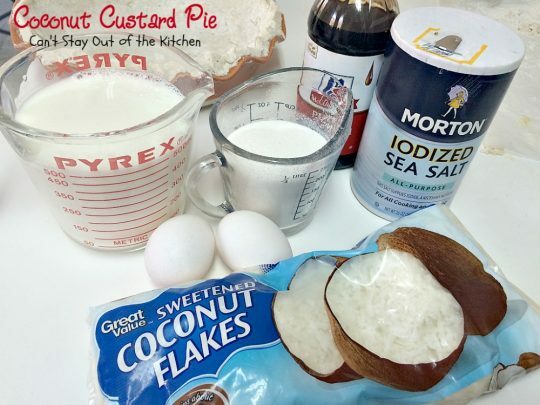 I served an Old Fashioned Pumpkin Pie along with his favorite Custard Pie and this Coconut Custard Pie. I teamed those delicious pies with Chicken A La King served over our favorite Homemade Rolls. On another night I served up one of our favorite soup recipes: Canadian Cheese Soup along with Homemade Rolls. So it was definitely a comfort food weekend for us! Coconut Custard Pie is one of my Mom’s great homemade pie recipes. 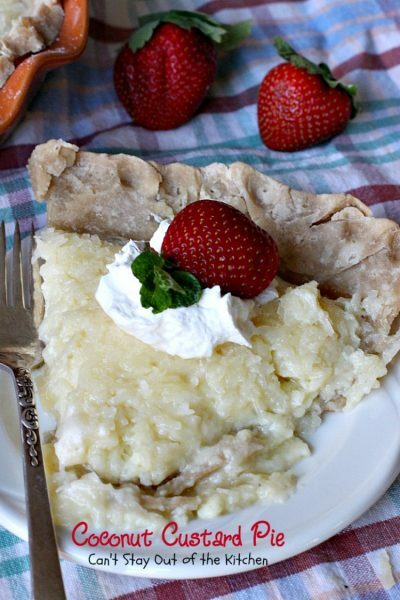 Every bite of Coconut Custard Pie is mouthwatering. Coconut Custard Pie is a great pie to serve company. I used these 7 ingredients. Whisk eggs. 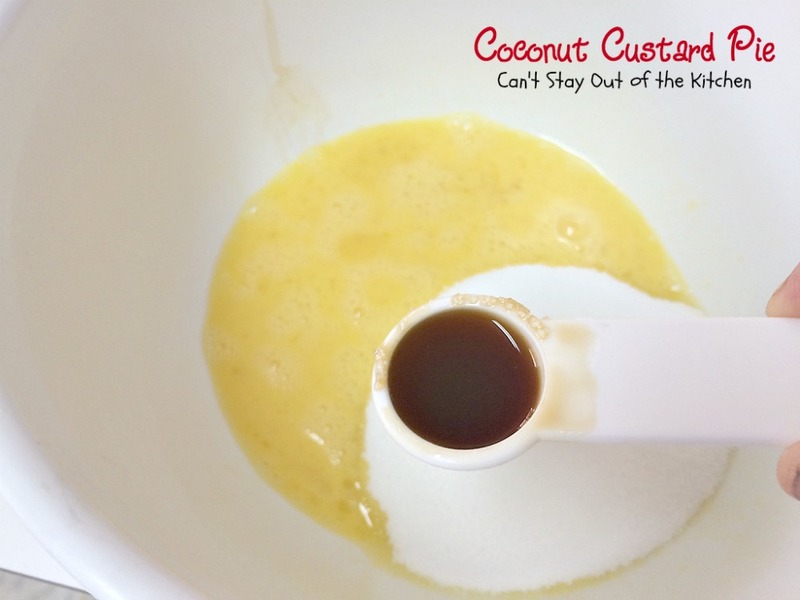 Add sugar, salt and vanilla. Scald milk. Heat milk over low to medium heat until it starts wrinkling over the top. Remove from heat. 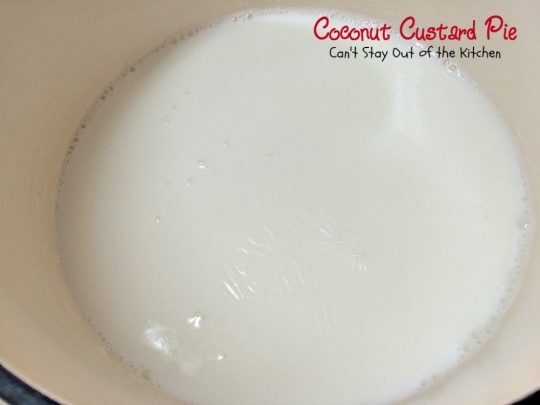 Add scalded milk to egg custard mixture. 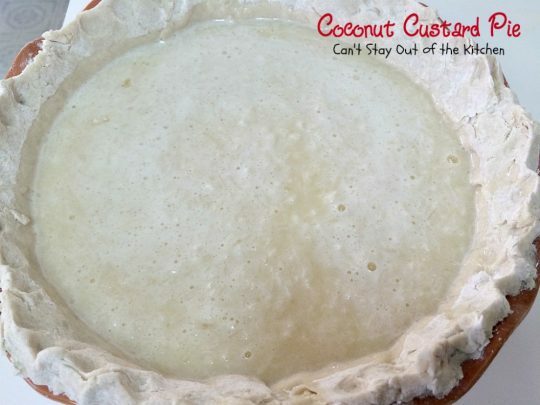 Pour coconut custard into unbaked pie shell. Bake at 350 for about 30 minutes or bake at 300 for about 45 minutes to an hour. If necessary, tent with foil after 30 minutes to prevent browning. Make sure you insert a knife into the pie to check for doneness. When it comes out clean the pie is baked thoroughly. 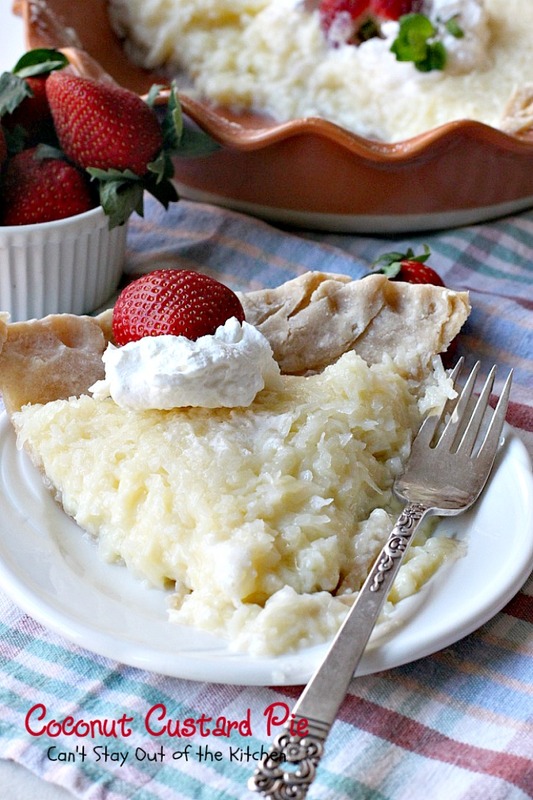 Coconut Custard Pie is one of the most delicious pies you’ll ever eat. 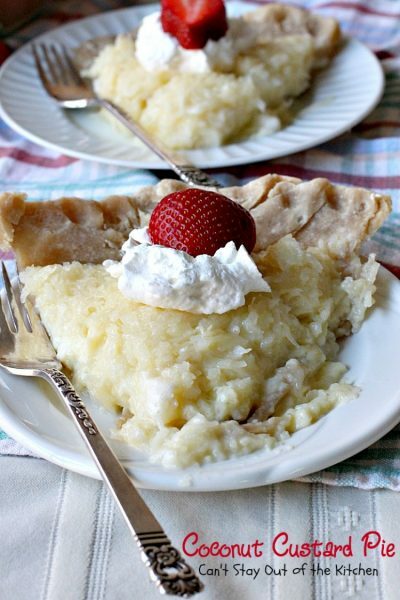 If you enjoy coconut, you’ll love this delicious pie. 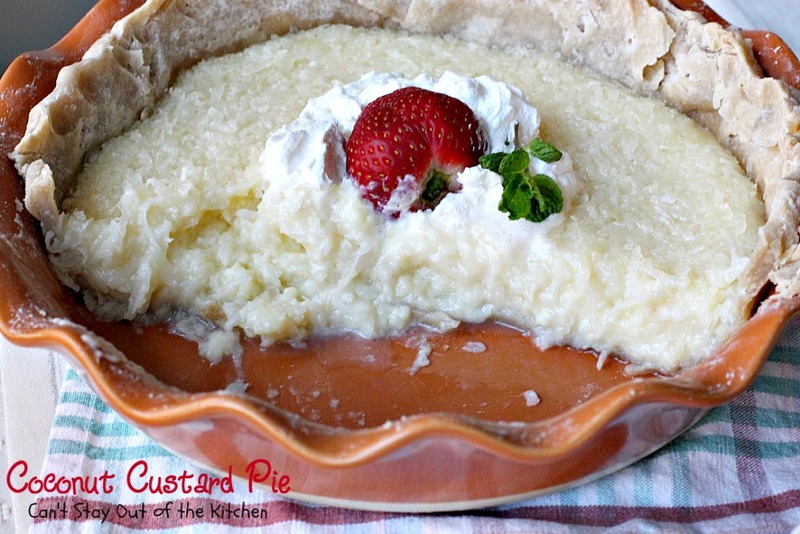 This delicious custard pie is filled with coconut and is one of the best pies you'll ever eat. 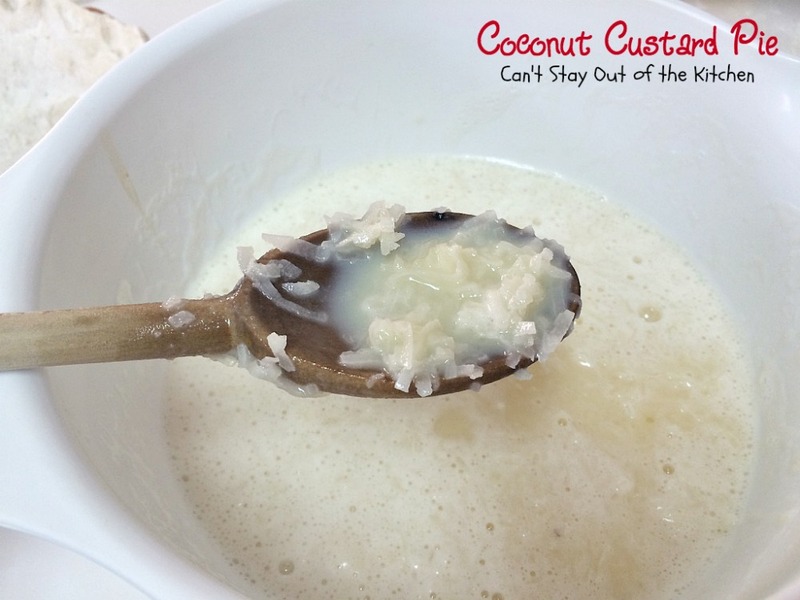 It's great for holiday baking, but so easy you'll want to make it frequently! Scald milk (bring just to the point where surface bubbles, but not boils). Beat eggs, add sugar, salt, and vanilla. Then and scalded milk slowly. Line pie plate with pastry, pour in custard. Bake in 350° oven for 25-30 minutes. 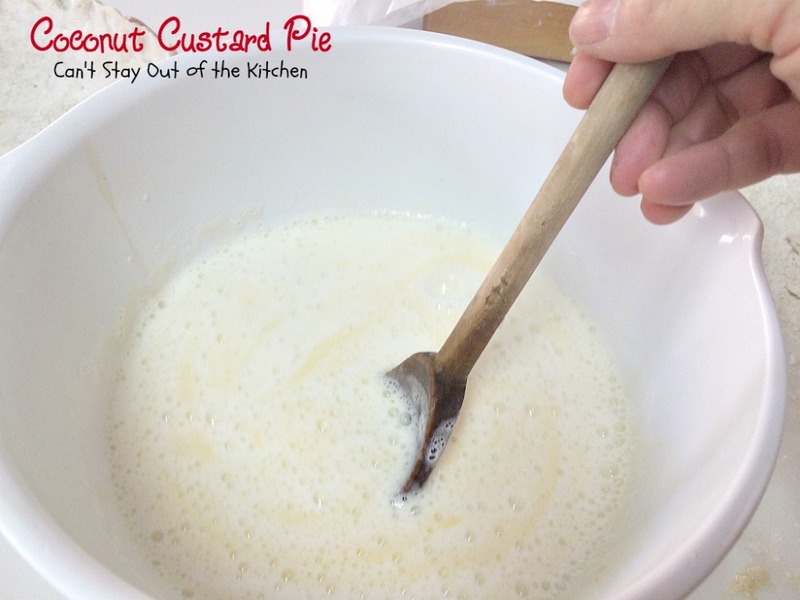 Custard is baked when knife inserted in center comes out clean. NOTE: I’ve never been able to get this to cook in less than 45 minutes. NOTE: Because I didn’t want the crust to burn I reduced the temperature to 300° and cooked this pie over an hour. NOTE: I tented the pie with foil after 30 minutes to avoid browning the crust. NOTE: Preparation time does not include time required to prepare pie crust. This delicious custard pie is filled with coconut and is one of the best pies you’ll ever eat. It’s great for holiday baking, but so easy you’ll want to make it frequently! Line pie plate with [url href=”http://cantstayoutofthekitchen.com/2012/12/05/homemade-pie-crust/” target=”_blank”]pastry[/url], pour in custard. I’ve never been able to get this to cook in less than 45 minutes. [br][br]Because I didn’t want the crust to burn I reduced the temperature to 300° and cooked this pie over an hour. [br][br]I tented the pie with foil after 30 minutes to avoid browning the crust. 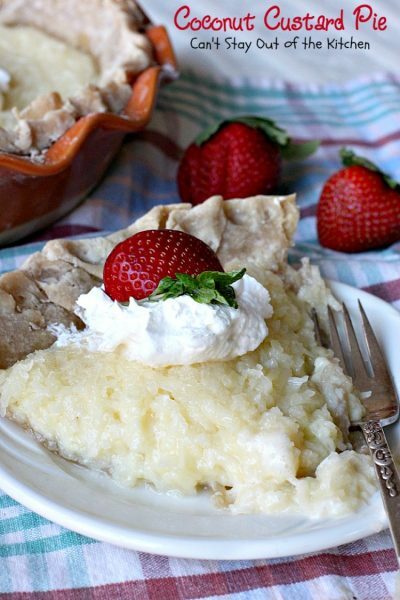 [br][br]Preparation time does not include time required to prepare pie crust. 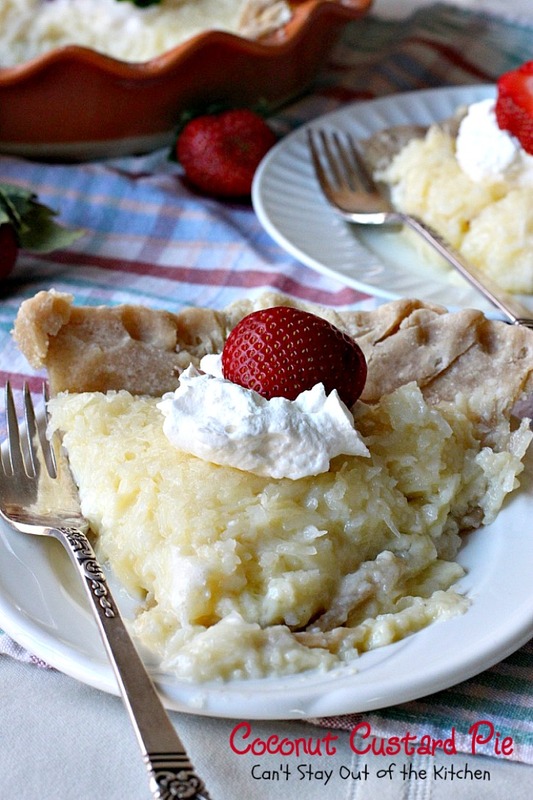 Coconut lovers will devour this pie. 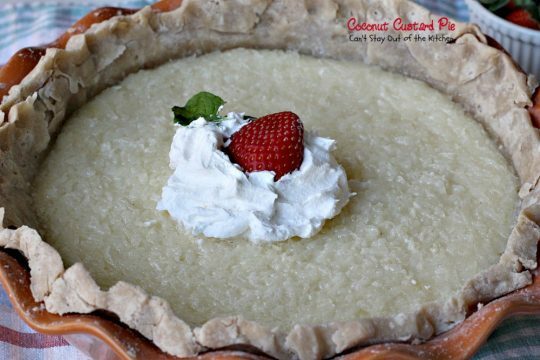 Coconut Custard Pie is a wonderful selection for holiday baking. Ok, I would totally love this, in fact, I would be scarfing this down and just so you know, I’m eyeing that custard pie too. Yum-O!